Once upon a time, the sight of Marco Reus stepping out onto the Borussia-Park pitch was one to warm the cockles of Borussia Mönchengladbach supporters' hearts - but since his return to Borussia Dortmund in 2012, it is now more likely to bring them out in a cold sweat. In just eight meetings with his former side, the Germany midfielder has plundered five goals and five assists, and there will therefore be a certain amount of trepidation among Foals fans as Dortmund travel to face Gladbach on Matchday 23, with Reus in line for another start after his winning comeback against Hamburg. It has been a long road back for the 28-year-old, who hadn't played since tearing his cruciate ligament in Dortmund's DFB Cup final win over Eintracht Frankfurt last May. He showed no particular ill-effects on Saturday, though, creating four scoring chances for his teammates and clipping through for Christian Pulisic to set up Michy Batshuayi for the opening goal. "Of course, I was absolutely thrilled to play again, to be back at the stadium and experience this feeling," Reus told bundesliga.com, after BVB saw it out 2-0 to claim their 500th Bundesliga home victory at the expense of HSV. "I'm pleased we could top it off with a win." Reus and Dortmund have now set their sights on Gladbach, who will still be smarting from a 6-1 thrashing at the Signal Iduna Park in the season's first Battle of the Borussias on Matchday 6. Reus was missing that day - but the last time he faced his old club in the Bundesliga, in April 2017, he opened the scoring from the penalty spot as BVB ran out 3-2 winners on the road. Having spent a decade with Dortmund as a boy, Reus rose to prominence with second-tier Rot Weiss Ahlen before joining Gladbach in 2009. Over the course of three Bundesliga seasons he notched up 36 goals and 26 assists for the Foals, which earned him a high-profile move back to his hometown club in the summer of 2012. He showed his former side no mercy when the teams met at the Signal Iduna Park that September, scoring his first brace for Dortmund as they stormed to a 5-0 win. Overall, Reus has been on the winning side of the Battle of the Borussias six times, and in the last four Bundesliga meetings between the pair he had a hand in no fewer than eight goals. Reus has already shown in the past that he is capable of hitting the high notes when he returns from injury. In November 2016, following a five-month layoff with a groin problem, he scored a hat-trick and set up two more in BVB's astonishing 8-4 win over Legia Warsaw in the Champions League. However, the Germany star was keen to temper expectations, despite his impressive performance against Hamburg. "When you make your comeback after eight months out, you can't expect to play your best game," he explained. "But I'll definitely take the positives from this one. We have to keep stabilising as a team and successfully take each small step forwards." After their clash with Atalanta in the UEFA Europa League, Dortmund's next small step will be Sunday's 100-kilometre trip to Borussia-Park, where Reus will be looking to shine once again and make it seven wins from nine against his former side. Gladbach have been warned. 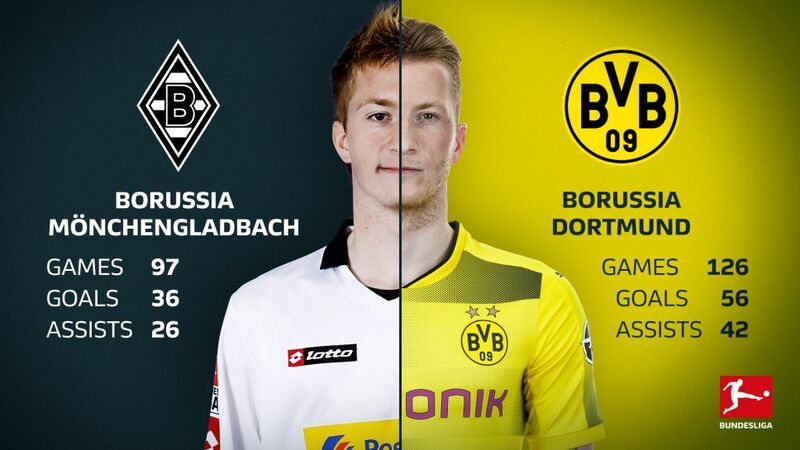 Click here for the Borussia Mönchengladbach vs. Borussia Dortmund Match Centre!